Any cancellation must be told minimum 1 months before. Follow our Hostel house rules. For groups reservation , we need 50% payment in advance. 3 Reasons to Come and Stay with us! If you like to get your party on; you love socializing from dusk till dawn; you're looking for an international entourage or you just want to kick back, enjoy yourself and see the sights then we want to welcome you to a brand new hostelling experience… Capsule Hotel Bali is Indonesia’s first modern youth hotel with backpacker prices! Located in the heart of Seminyak and modelled on the unique, stylish, modern, Japanese pod hotels. This is the perfect place to party, meet people and explore Bali. We provide the cheapest beers in Bali! As well as cheap cocktails, daily drink deals and challenges, beer pong/flip cup/slap cup/relay-chug table and the legendary Sunday Session party bus to Single Fin. If you are staying with us on a Sunday it’s not to be missed! If you fancy a night off from partying we also have popular common room with beanbags, sofas and over 100 films to choose from. Plus you can eat quality, delicious food at backpacker prices every day from our kitchen or you can make use of mini guest kitchen including microwave toaster and fridge freezer. Lastly our International staff will be able to recommend you the best spots to eat, drink, party, surf, explore, see and experience in Bali. Our motto: Arrive as our guest and leave as our friend! We are an Open-air hostel, please use your sandal. Except in 1st Floor where we put the sign “take off your shoes or sandals” (TV lounge area). Airport Pick Up: We can help you to arrange an airport pick up for IDR 180K /vehicle (with third party provider). A car can fit up to 4 people comfortably. There will be an extra charges IDR 50K if between the hours of midnight and 6am. Please inform us 1 day in advance if you require this service. BE AWARE!! Airport taxi drivers will try and rip you off. Either haggle with them to pay around 180.000 to 200,000 IDR. Please don’t pay more than 200,000 IDR!!! The swimming pool is 3 meters deep equipped with its very own volleyball net, in the shallow end. A fully operational bar and kitchen as well as a mini kitchen for guests use. We also have a common room with Cable TV and over a 100 free DVDs, laundry service, motorbike rental, motorbike parking area travel advise and tours, communal board games, cards against humanity, air conditioning in every room, universal plugs and a reading light for every bed (no more chunky adaptors), two comfy pillows for every bed, a book exchange, a secret rooftop terrace, the “Tower of Power” and free, communal; hair-dryers and iron! We have a range of dorms to suit a range of needs from 14 bed dorms to private rooms. Every bed in the hostel has TWO plump comfy pillows, a high quality mattress + duvet (not blanket) to ensure you get a great night sleep, as well as a reading light and a plug socket. Please note if you’re looking to experience the famous capsule style pods please choose the 14 bed dorm, 10 bed dorm, 8 bed dorm or 6 bed dorm WITHOUT en suite. We can get you the cheapest rate in Bali to the Gili Islands, with an open return so you’re free to come back whenever you’re done tanning and partying. Plus our agents will drop you back in most area in Bali for free! 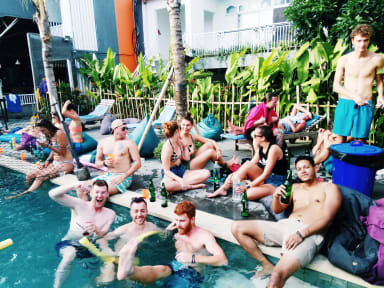 Whether you want to chill out in Ubud, get some surfing done in Uluwatu or maybe you want to come back and party in Seminyak just ask and it can be arranged. The entire hostel is equipped with a video monitoring system as well as state of the art key card locks on every room. 4 digit code operated lockers for every bed in each dormitory, (big enough for your entire bag and you!) excluding the en suite dorms and every private room is furnished with a safe. Your welcome to bring friends into the social area for a the party in the evenings or to chill with you during the day including using the pool. Please note that ONLY guests are allowed in the rooms or upstairs to the first floor and beyond!